VitalBet is a very new bookmaker website. It is running since 2015. 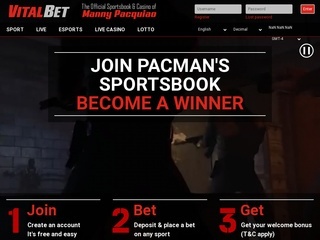 VitalBet is known as the official bookmaker platform of Manny Pacquiao. That’s right – the idea came after the match of Manny versus Floyd Mayweather Jr. VitalBet is based in Costa Rica and is one of the few sportsbook websites that accept Bitcoin as a currency. Maybe this fact is a part of what makes this bookie so popular. This betting site is based on the sports_v2 platform. The visuals are very pleasing, and the usability and performance are great. As a whole, VitalBet is very well organized, easy to use and has the support of Manny Pacquiao himself. The popularity of the website among the better ones around the world is not as big as with, the bigger bookmakers. However, the efficient design and attractive offers keep skyrocketing VitalBet upwards. For a website that was released this year, a global ranking of 109000 and USA ranking of 50000, it is quickly becoming one of the most visited betting sites in the States. Of course, the bigger part of the visitors are from the US. VitalBet is hoping to gain enough traction to become a top-reviewed business and so far – they are doing great. Manny’s name is a great advertisement by itself! Recently VitalBet has cooperated with Buff88 in order to go on a higher level of services of the widest selection of cryptocurrencies available on a betting website. VitalBet offers a plethora of options to their players. Their sportsbook consists of football, boxing, baseball, basketball, ice hockey, tennis, mixed martial arts, rugby, volleyball, handball, and golf. The unique feature here, though, is the e-sports betting. VitalBet covers a variety of e-sports events, including (but not limited to) Counter-Strike: Global Offensive, StarCraft 2, League of Legends and Dota 2. The website generously offers live betting, and players can also enjoy watching the games live, usually through Twitch.tv. Aside from the sportsbook, VitalBet also hosts a very nice casino experience. Some of the available games are Bitcoin dice, video poker, slots and a variety of table games. Live casino options include roulette, baccarat, and blackjack. 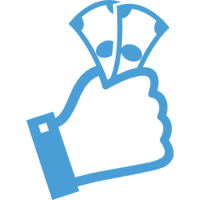 If you are more into ticket games, the website lottery and Keno are an excellent way to bet, minus the adrenaline rush. Another distinctive feature is the partial cash out. This option gives players a lot more control over their bets and allows them to return a part of the bet before the event has finished. Having a change of heart about who will win? Have to run errands? Late for a meeting and the match has just entered overtime? Don’t worry, VitalBet has you covered. Yes, you will lose a part of the bet, but you will get the majority of your funds back. The other feature is the progressive jackpot. Usually, the bookmaker chooses several events during the week and scales the jackpot based on the people betting. The catch is that to be eligible for the jackpot; you have to place a minimum of 0.25 EUR on all 13 events. You also have the choice to pick either single, double or triple predictions for each event. In case more than one player win the jackpot, it is distributed equally among the winners. VitalBet offers a rather small choice of odds to bet. The most common are Winner, Asian handicap and Match totals. The half-time bets are 1st half odds, 1st half Asian handicap, and 1st half totals. The odds vary between sports but are usually very competitive. E-sports bets also offer Map advantage and Winner map X options. Aside from sports, the casino has some nifty jackpots, waiting to be taken. All in all, the online bookmaker knows how to keep players coming back for more. The odds can be seen in American, Decimal, Fractional, Hongkong, Indonesian and Malay format. VitalBet can be viewed in more than one language – English, Turkish, Russian and Chinese. The customer support associates sport an e-mail and an English support telephone. If you wish to write, instead of talk, you can use the familiar live chat feature. There, you can speak to other users of VitalBet and even get support for less sensitive issues. The security of the website includes regulations by Curacao eGaming, which provide a fair gaming experience for all customers. 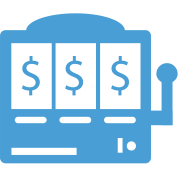 The bookmaker also handles the financial part through an SSL secured connection. As this has become the norm, do not trust websites that handle money and don’t use high levels of encryption. With VitalBet, your money and identity are safe. The most important feature of VitalBet is the option to deposit funds with digital assets. Other forms of deposit options include the card and bank transferring methods. Withdrawal methods are almost the same. There are currently three bonus programs going on at VitalBet. There is a first deposit bonus – a 100% add-up up to 50 USD/EUR. The minimum to this bonus is 10 EUR/USD. The second one is a 2 EUR/USD bonus without a deposit. New accounts receive this extra upon entering a code after registering. The third gift is a bit more cryptic. It’s called Vip Deposit Bonus. It gets distributed to players by the VitalBet management on special occasions. Currently, there is no loyalty program running, but this might change with time. No website starts with lots of offers. The ability to bet on e-sports and with Bitcoins is a bigger incentive than a measly deposit or casino bonus.